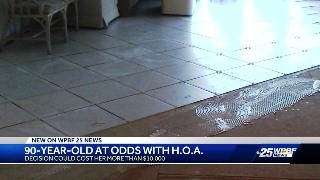 PALM BEACH GARDENS -- A 90-year-old woman who lives at The Longwood says the Homeowners Association is forcing her to rip up new tile she put in her condo or pay $6,500. “I just hope that they would let me rest in peace, I think they want me to move and I am not moving,” says Caracciolo. Rosemarie Caracciolo bought a condo at The Longwood in 2016. She made some changes right when she moved in like buying a new water heater, ripping up the old carpet, and replacing the garbage disposal. But it wasn’t until she installed these tile floors several months later that she started getting backlash from the Homeowners Association. “It looks like I am going to have to pull it up, they aren’t going to leave me alone,” says Caracciolo. The great grandmother of three says she has been harassed by the HOA for nearly a year over the tile. “I did everything according to the way it should be done, I put the underlay, I put the tile,” says Caracciolo. She says she bought the tile and the cork underlay from Floor and Décor and has the receipts to prove it. But she says the property manager and the HOA are now forcing her to rip up the tile because she didn’t file the proper paperwork. She says she went down to the office before doing the work but was turned away. “She just shooed me out of there, she doesn’t do it, I said let me leave the paperwork, she didn’t even say to me this is the person you have to talk to or anything,” says Caracciolo. We spoke with the HOA President over the phone, who says the underlay she purchased is not up to proper standards to be soundproof. The HOA has given her 6 months to rip it up and re-do it. Between the material and labor, she will be out more than $10,000 once it’s all said and done.